The Canopy Tour outdoors expedition includes a canopy tour zip lining through the rainforest and also a visit to the butterfly gardens and snakes exhibition. 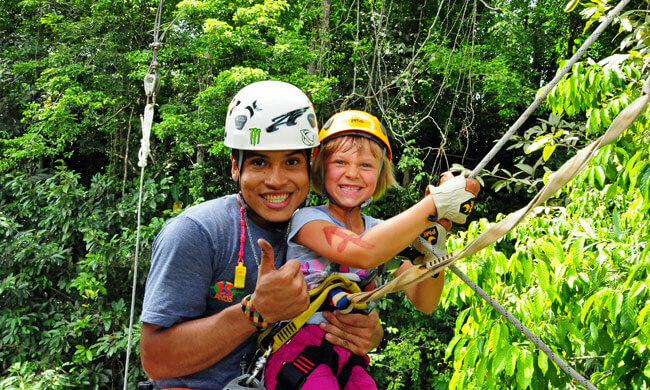 This is a great day for any age looking for a unique adventure and Costa Rican nature experience. Your trip begins when you are picked up from your hotel and driven through the tropical rainforest for 40 minutes where you will have the opportunity to spot toucans, monkeys, poison dart frogs, and lots of tropical plant life. When you arrive, enjoy a traditional Costa Rican breakfast or lunch at the Ranch House before a safety brief with your bilingual local guides. The guides will get you set up with your equipment and then off you sail through the treetops of the tropical rainforest canopy! There are 10 exhilarating zip lines, one suspension bridge, a Tarzan Swing and three pulse-pounding rappel lines with your guides pointing out and explaining the different flora and fauna all around, from the poison dart frogs to the walking palm tree. Once you have finished the exciting canopy course, your guides will take you into the on-site butterfly farm where you can enjoy a wide variety of native species that can be found from all over Costa Rica. Then a visit to the snakes exhibition to see the many different species of snakes, poisonous and non-poisonous. Don’t worry – they are behind glass! Additional notes: You do not need to be in great physical condition, as this is not a strenuous tour. No age limit. Young children can be carried by the guides. Suitable for adventurous people. Tour includes: Drinks, snacks, breakfast or lunch, guide, equipment, transportation, visit to the Butterfly Garden and Snake Exhibition. What to bring: Comfortable clothing and shoes, repellent, sunscreen, raincoat or jacket, camera.